Whether you’re a self-employed consultant or a successful brand, your blog is a powerful tool for selling to your customers. Everyone knows that right? The thing is it will only ever be as effective as the content you fill it with. That’s also a given. Then you need to rethink why you have a blog in the first place. Then it’s virtually worthless. Controversial? Or just common sense? Having a blog just for SEO doesn’t fly anymore. If you’re not creating content that your readers love then you’re wasting your time – and not just from an SEO perspective. Have you been on Twitter lately and seen the amount of blog posts shared minute-by-minute just in your sector? WordPress users, for example, publish more than 40 million new posts every month. Get heard above the noise – create something exceptional for your readers. Exceptional content will create an exceptional impression of your business. This is what you should be aiming for at every turn. In these days of free tools and information it doesn’t take much to start refining what you do to so that it aims for excellence. So let’s get to the meat – how do you improve your writing and your communication skills to get better results? Whatever you’re blogging about, good copywriting practices can help you get the results you want. We’ve picked a handful of time-honoured copywriting concepts that can also apply to blog writing. How can you communicate with someone well if you don’t know them? You can’t get to know all your readers on a personal basis, but you can develop a general idea of who they are and what’s important to them. Are they young or old? Thrifty or indulgent? What kind of education and social background do they have? The answers to these questions will enable you to develop a picture in your mind of whom you’re writing for. This will help you to adapt your tone of voice and the type of content you produce. Who am I writing for and what do they want to know? You know those little details that you slaved over when you put together your product? Or the impressive technical specs that you lavished care and attention over? They aren’t why people buy things from you. People don’t buy because of the features of your product or service. Sure, they’re important but what sells are benefits. How do you know what the benefits are? Now you know your customer, (see above) you can put yourself in their shoes and ask “what’s in it for me?” It’s the million-dollar question in copywriting. Remember though, when you’re writing a blog you’re selling your content first. Don’t ram a sales message down your readers’ throats in your blog posts – it’s a massive turn off. Give your readers what they want to read and interest in your product or service will follow. Your customers want to know how your product, service or the content you’re serving them up will benefit their lives. Why should they give your blog a valuable five (or even two) minutes of their time? What are they going to learn that helps them in their life? What are they going to feel that’s going to be worth their trouble? That word “feel” is all-important. Your audience may read with their eyes and process information in their minds, but they react from their heart. To get people to take action of any kind, you need to make them feel. Try and think about your content from an emotional perspective. 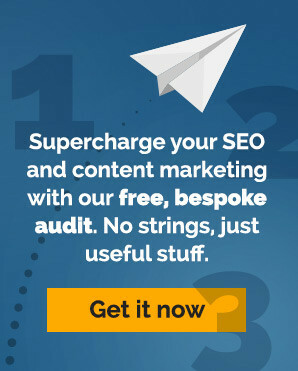 What are they going to feel when they’ve finished reading your content? Inspired? Enlightened? Entertained? Educated? Curious? Angry? How does this content make my customers feel? Maybe you’ve got access to insights that your competitors don’t have. Or you respond to every blog comment you receive. Or you have a knack for distilling complex concepts down into easy to understand and actionable posts. Be different and stay different to stand out. What do I offer that nobody else does? The rule of three applies to most forms of writing, from copywriting and journalism to blogging and fiction. It states that three things in your writing is more effective than one, two or four. Something about groups of three is more satisfying, compelling and easier to process. What writing devices can I use to entertain, educate and inform? Written in the first part of the 20th century, it’s certainly true now in the age of digital bombardment and ad overload. Empty hyperbole doesn’t work and is an insult to the reader’s intelligence. Appeal instead to her sense of reason and provide her with specific examples why what you say is true. How can I provide evidence for what I’m writing? In the world of the passive voice, things just happen. Rather than sounding decisive, everything gets a little wishy-washy. Which sounds better to you? In this instance, the passive voice suggests that following the blog is something that can be done by someone. The active example meanwhile instructs the reader that they can and should follow the blog. Is my writing active? Or could it be considered passive? You should always aim to say what you mean in the simplest possible terms, in the shortest space. If you make your blog posts too complicated you risk isolating large swathes of your audience. So use plain English. A possible exception is when you’re blogging about a specialised subject to an educated audience. Even then, succinct blogging will keep your audience’s attention and make it more likely that they will return. Check out our post on readability for more help. Is my blog writing easy to read and understand? Developing an excellent blog takes time. Decide on some simple metrics to use – traffic, social media engagement, comments – and use research tools like SEM Rush to research content opportunities. Ask yourself do I have a content strategy in place? Or am I just hoping this will work out well? Alternatively put your blog in the hands of a pro. We research, write and distribute blog content that produces results.